On February 24, 1925, an article published in the Fort Worth Star-Telegram suggested Tech's athletic teams be called the "Dogies" explaining that "a Dogie is a calf whose mother died and is forced to look out for itself" and "If ever anything had to rustle for itself, it was West Texas and Tech College." Behind football and men's basketball, baseball is the third oldest sport at Texas Tech. The initial team organized in 1925 and the first game, an 18–9 victory over West Texas State Teachers College, was played in 1926. In the following game, the team suffered its first ever loss, 14–9 to the team it had previously defeated. The third game in the team's history—this one against Daniel Baker College—ended in a 3–3 tie after 11 innings. E. Y. Freeland was the first coach of the Red Raiders, though the team was known as the Matadors at the time. He remained in the position for three years before R. Grady Higginbotham took the role. Higginbotham coached for only two years. From 1930 to 1953, Tech did not field an intercollegiate baseball team. When the program returned in 1954, Beattie Feathers became the head coach of the Red Raiders and remained until 1960. He was followed by Berl Huffman (1961–1967), Kal Segrist (1968–1983), and Gary Ashby (1984–1986). Upon Ashby's departure, Larry Hays became the head coach of the team. Texas Tech's baseball team plays at Dan Law Field at Rip Griffin Park and is coached by Dan Spencer. Larry Hays had been the Red Raider's head coach for the previous 22 years and accumulated over 800 wins with Texas Tech. On April 2, 2008, Hays became just the fourth coach in NCAA baseball history to win 1,500 career games. The Red Raider's first ever win came on April 5, 1926 against New Mexico Military Institute. During the 1990s, Tech players drew notice from 17 big league organizations. Two Red Raiders were selected in the second round, one each in the third, fourth, and fifth rounds. As of 2002, 16 former Tech players have appeared in Major League Baseball. Larry Hays took over the Red Raiders baseball team in 1987. Under Hays, Texas Tech endured only two losing seasons, his first and last, and enjoyed their greatest success in baseball. Hays took Tech from having a losing tradition to being a national contender. When Hays started with the Red Raiders, the team's overall record stood at 550–576. By the time he left, he was the fourth-winningest coach is college baseball history and the team's record had improved to 1,365–1,054–9. The Red Raiders reached eight straight NCAA tournaments from 1995–2002 and again in 2004, three of which were held at Dan Law Field. They also won two conference championships, in 1995 (while still in the Southwest Conference) and 1997, and two conference tournament championships, in 1996 and 1998. The team is currently coached by Tim Tadlock who was hired as associate head coach for the Red Raiders under Dan Spencer. The following season saw Tadlock replace Spencer as the ninth head coach of the Red Raiders following Spencer's firing. Tadlock's first season saw the team finish 26–30, and 8th of 9 in Big 12 play. Prior to the 2014 season, the Red Raiders were selected to finish in 8th place in the Big 12 Conference in the preseason polls. In only his second season, the Red Raiders won their first NCAA Tournament Regional Championship, defeating the Columbia Lions and host team Miami Hurricanes to advance to the program's first Super Regional appearance. The team would host the College of Charleston in the Super Regional round before shutting them out twice in two 1–0 games, earning the programs first berth in the College World Series on the back of a 0.65 post season earned run average produced by assistant coach Ray Hayward's pitching staff. Texas Tech's cross country and indoor/outdoor track & field teams are coached by Wes Kittley. Under his leadership, the program has reached new heights. At the 2005 Outdoor National Championships, Tech qualified 31 men's and women's athletes, more than any other school in the country. Under Kittley's tutelage, Texas Tech has produced 16 national champions, seven Olympic Medalists, over 200 All-Americans and over 119 Big 12 Champions. From 1990 to 2006, the men's team garnered 91 All-America awards, 20 Big 12 championships, and one individual national title. In the same time period, the women's team won 32 All-America awards, 29 Big 12 championships, and five individual national titles. During the 2007/08 season, the women had another strong showing behind Sally Kipyego, who won four individual national titles (cross country, indoor 3000 m and 5000 m, outdoor 10,000 m) and placed second in her bid for a fifth title in one academic year (outdoor 5000 m). Kipyego added three more national titles (cross country, indoor 5000 m, outdoor 5000 m) and one more second-place win (outdoor 1500 m) during the 2007/08 season. Under Kipyego's leadership, the women's team captured its first title in 2008. Their success was followed by another national championship appearance in 2009 and 2010. Kennedy Kithuka followed up on the prior success of the program by winning the 2012 NCAA Cross Country Championship, being the first in the men's program to do so. For his accomplishments, Kithuka was named the 2012 National Male Athlete of the Year for cross country. In 2015 NCAA Division I Indoor Track and Field Championships, Jacorian Duffield and Bradley Adkins won 1st and 2nd place respectively in the high jump event. The men's team has won two Big 12 Champions (2005, 2014) and the women's teams has won three (2008, 2009, 2010). The Red Raiders football team is a member of the NCAA Football Bowl Subdivision (formerly known as Division I-A). Texas Tech played its first intercollegiate football game on October 3, 1925. The contest, against McMurry University, ended in a controversial 0–0 tie. Tech's Elson Archibald seemed to have kicked a game-winning 20-yard field goal but the referee ruled that the clock had run out before the score. It was later reported that the referee made the call to get revenge because he wanted to be the team's first head coach but the job was instead given to Ewing Y. Freeland. Through the 2015 season, the Texas Tech Red Raider football team has amassed a 551–429–32 record in 91 seasons (1925–2015). In 1932, the program joined the Border Intercollegiate Athletic Association. Five years later, the team won its first conference championship and was invited to the Sun Bowl. The game was played on January 1, 1938, and resulted in a 6–7 loss to West Virginia. Texas Tech suffered four more bowl losses before getting their first postseason win in the 1952 Sun Bowl. Before withdrawing for the Border Intercollegiate Athletic Association in 1956, the Red Raiders won a total of eight conference championships and one co-championship, the most titles held by a Border Conference team. In 1960, Texas Tech was admitted to the Southwest Conference (SWC). The Red Raiders won conference co-championships in 1976 and 1994. The team remained in the SWC until the conference ceased operations 1996. Following the dissolution of the SWC, the university became a charter member of the Big 12 Conference. In the Big 12 Conference, the Red Raiders competed in the South Division from the athletic conference's formation until the 2010 season when the divisions were dissolved. The Red Raiders, coached by Mike Leach from 2000–09, earned 56 wins from the 2000 through the 2006 season. During the same period, only three other Big 12 teams had more victories—Oklahoma, Texas, and Nebraska. In fourteen of its last fifteen seasons Tech finished with a winning record, before suffering a losing season in 2011 under then-head coach Tommy Tuberville. Tuberville resigned his position and was replaced by Kliff Kingsbury in 2013. The Red Raiders have made 36 bowl appearances(14–21–1), which is 20th most of any university. 2007 saw the men's golf team compete in its first back-to-back National Championship tournaments since 1960. The team, coached by Greg Sands, qualified for the tournament after finishing 7th in NCAA Central Regional. Basketball came to Texas Tech only two years after the school was founded and the program has since won 18 conference titles, the last one being in 1996, all of which have been won while the Red Raiders were in their Border Conference and Southwest Conference tenures. The inaugural game was a 37–25 loss to Daniel Baker College. Tech would lose two more games before finally clinching their first ever victory���35–21 at Sul Ross University. Grady Higginbotham was the first coach, earning a 14–18 record over two seasons. At .438, Higgenbotham was the only Tech basketball coach to garner an overall losing record during his stay. Following Higgenbotham's departure, Victor Payne led the Matadors (as the school's teams were known until 1936) from 1927 to 1930. His final tally stood at 32 wins and 20 losses. W. L. Golightly coached only one season, bringing in an 11–9 record. Dell Morgan held the head coaching job from 1931 to 1934, chalking up 42 wins to 29 losses. He was followed by Virgil Ballard. Though Ballard coached only a single season, it was during his time that the team won their milestone 100th game, a one-point victory over House of David. Ballard left with a 15–9 record. Gene Gibson followed Robison into the position. In his eight seasons, he chalked up the second worst record of any head basketball coach at Tech. Still, at 100–92, there were eight more wins than losses. Bob Bass led the program to a 22–15 record over a season-and-a-half before returning to professional basketball coaching duties. Bob Knight became the men's basketball coach in 2001. He retired on February 4, 2008. On New Year's Day 2007, a 70–68 defeat of New Mexico by Tech marked the 880th total win for Knight, making him the winningest coach in men's college basketball history. Knight also has several other distinctions, including being the only coach to win the NCAA, the NIT, the Olympic Gold, and the Pan-Am Gold, and has been given several awards. Knight was succeeded by his son Pat Knight. After Pat Knight's termination, Billy Gillispie was named head coach on March 20, 2011 and subsequently resigned due to health reasons after one season following while also being amidst allegations of mistreating players. Chris Walker took over on an interim basis for the 2012 season and led the red raiders to an 11–20 record. In March 2013, Tubby Smith was named the new men's basketball coach and lead the team to its first upset over a top 25 opponent since 2009. Texas Tech students broke both school and Big 12 Conference records for student attendance at the United Spirit Arena during a February 25, 2014 loss to Kansas State. The record of 6,086 students fell less than 2,000 short of the national record. The Red Raiders hired former Arkansas-Little Rock coach Chris Beard on April 15th, 2016. Beard led the Red Raiders to almost immediate success, leading them to their first ever Elite Eight in 2018, and leading them to their first ever Final Four in 2019, along with a national championship berth. Beard won AP Coach of the Year in 2019. The Red Raiders softball program began in 1981 but the program was dropped after only five seasons. When Texas Tech joined the Big 12 Conference as a charter member, the program was resurrected in time for the inaugural 1996 season. Shanon Hays, the first Lubbock Christian University head softball coach, turned the Red Raider softball team around from a 15–42 season under interim head coach Amy Suiter to 80–34 in just his first two seasons. Hays led the Red Raiders to three NCAA Regional appearances during his five seasons at the helm. Adrian Gregory was named the seventh head coach in Texas Tech history in June 2014. Tim Siegel has been coaching at Tech for 15 years, helping the men's tennis team to numerous winning seasons. Siegel was recently honored as the 2008 Big 12 Coach of the Year. He has coached players who are now college coaches themselves. The men's tennis team had a very successful 2008 season being ranked as high as #17 in the nation. The Red Raiders faced 11 ranked teams and have only lost to two, #31 TCU and #11 Tulsa. Texas Tech ended the regular season ranked #17. Most recently, the Red Raiders 2012 season resulted in a closing ITA ranking of 19. The Texas Tech tennis team won the Border Conference tennis championship in 1936, 1937, and 1950. The woman's team, led by Todd Petty, won the Big 12 Conference in 2012. Of the varsity sports, Texas Tech has had its greatest success in women's basketball with 13 conference titles and 1 national championship. Led by its star player Sheryl Swoopes and head coach Marsha Sharp, the Lady Raiders won the NCAA Women's Basketball Championship in 1993. In early 2006, Lady Raiders coach Marsha Sharp retired and was replaced on March 30, 2006 by Kristy Curry, who had been the coach at Purdue. Curry accepted the same position at The University of Alabama on May 11, 2013 and was replaced by Candace Whitaker, a former player for Texas Tech in the 1990s, who was named head coach on May 22, 2013. The Texas Tech volleyball program began in 1975. The Red Raiders were most recently coached by Don Flora (2011–15). In addition to varsity sports, the university's Sport Clubs Federation offers 30 recreational and competitive sport clubs, including polo, rugby union, lacrosse, fencing, soccer, and esports. The Texas Tech Ice Hockey Team was established in 1999. As a member of the American Collegiate Hockey Association, the Red Raiders compete with Big XII Conference Teams as well as with colleges throughout the United States and Canada. Players are recruited from the United States, Canada, and abroad. Of the clubs sports, Texas Tech's Polo Club team, coached by Clyde Waddell, has had the greatest success. In spite of having no previous experience, at the invitation of students, Waddell took the job in 2000. Six years later, the team beat in-state rival Texas A&M to win the United States Polo Association National Intercollegiate Championship. Texas Tech's rodeo club team competes in the National Intercollegiate Rodeo Association and won the 1955 championship at the College National Finals Rodeo. Texas Tech rugby plays in Division 1-A in the Allied Rugby Conference, a conference composed primarily of schools from the Big 12 South, against its traditional rivals such as Texas and Texas A&M. For the 2011–12 year, Texas Tech had also fielded a side to play in Division 2, where they won the Texas championship and qualified for the national playoffs. Jones AT&T Stadium serves as home to the Red Raiders football team. The stadium, named for Clifford B. and Audrey Jones, opened in 1947. In 2000, the stadium was renamed Jones SBC Stadium after SBC Communications made a $30 million contribution to the university. Following SBC Communications' acquisition of AT&T Corporation in 2006, the stadium was renamed Jones AT&T Stadium. The stadium's original seating capacity was 27,000, but it was expanded in 1959, 1972, 2003, 2005, 2009, 2010, and 2013 to the current capacity of 60,862. Overall, from 1999 to 2009 the school spent more than $84 million for ongoing renovation and expansion to the stadium and the football program. In January 2013, construction began adding another 368 seats in the north endzone, in addition to an observation deck that will hold 40. The $11 million project also includes a significantly upgraded jumbotron with a new sound system, a Spanish Renaissance-themed colonnade, and a new north end zone concourse connecting the two stadium halves. Along with the other additions, 157 feet of ribbon board will be added on the north end zone, more than 160 linear feet in the northeast and northwest corners of the stadium, and 94 linear feet in the south end zone over the athletic offices. All of the new features of Jones AT&T Stadium were unveiled on September 7, 2013 . Since 1999, home basketball games have been played at United Supermarkets Arena (originally United Spirit Arena), a 15,020-seat multi-purpose facility which cost $62 million to build. In addition to serving as home to the men's and women's basketball teams, the arena is used by the Red Raiders volleyball team. Texas Tech has won 1 NCAA team national championship. Texas Tech has won 70 conference championships: 21 Big 12 Conference titles, 27 Southwest Conference (SWC) titles, and 22 Border Conference titles. The Red Raiders were originally known as the "Matadors" from 1925–1936. As the school was thinking of an appropriate nickname for its athletic teams in 1925, the wife of the first football coach suggested "Matadors" to reflect the influence of the campus' Spanish Renaissance architecture. The students followed the suggestion, and later chose red and black as the school colors to represent a matador's traditional garb. Coincidentally, the football team won its first game right after it had adopted the name. The nickname and school colors became official during a formal convocation on March 15, 1926. There are two main stories as to how the name "Red Raiders" replaced its predecessor. In one story, football coach Pete Cawthon ordered attractive scarlet uniforms to help the team's identity. The football team, wearing its new outfit, defeated heavily favored Loyola in Los Angeles on October 26, 1934. A Los Angeles sports writer called the Matadors a "red raiding team". Other writers who covered Tech sports caught on with the term and successfully promoted the use of "Red Raiders". In the other tale, former Lubbock Avalanche-Journal sports columnist Collier Parris, reporting on a 1932 Tech football game, wrote: "The Red Raiders from Texas Tech, terror of the Southwest this year, swooped into the New Mexico University camp today." The name soon became popular afterward and by 1936, it officially replaced "Matadors" at the same time the Saddle Tramps came about. Red Raider spirit is led by such organizations as the Saddle Tramps, the High Riders, and the spirit squads (consisting of the cheer squad and the pom squad). In April 2010, the Texas Tech cheer squad finished third at the National Cheerleaders Association and National Dance Association. The Masked Rider is Texas Tech University's oldest mascot. The tradition began in 1936, when "ghost riders" circled the field prior to home football games. The Masked Rider became an official mascot in 1954, when Joe Kirk Fulton led the team onto the field at the Gator Bowl. According to reports from those present at the game, the crowd sat in stunned silence as they watched Fulton and his horse, Blackie, rush onto the football field, followed by the team. After a few moments, the silent crowd burst into cheers. Ed Danforth, a writer for the Atlanta Journal who witnessed the event, later wrote, "No team in any bowl game ever made a more sensational entrance." In 2000, The Masked Rider tradition was commemorated with the unveiling of a statue outside of the university's Frazier Alumni Pavilion. The sculpture, created by artist Grant Speed, is 25 percent larger than life. Today the Masked Rider, with guns up, leads the team onto the field for all home games. This mascot, adorned in a distinctive gaucho hat like the ones worn by members of the marching band, is one of the most visible figures at Texas Tech. Ashley Wenzel, a sophomore education major from Friendswood, Texas, will represent the university as the Masked Rider during 2012–13. Since 1996, a traveling trophy called the Chancellor's Spurs is exchanged between the winner of the annual Longhorn–Red Raider football game. Texas Tech's main athletic rivals are the Texas Longhorns and Texas A&M Aggies. It is common for people to camp out in front of Jones AT&T Stadium a few days prior to home football games against the Aggies, the Longhorns, and the Oklahoma Sooners. In March 2009, Texas Tech and Baylor reached an agreement to move their next two football games to the Dallas metropolitan area. The schools played November 28, 2009, at Cowboys Stadium in Arlington with Tech claiming the victory. The next game was scheduled for October 9, 2010, at the Cotton Bowl Stadium during the State Fair of Texas, with Tech emerging victorious again. The arrangement was extended for an additional two years. In sports other than football, Eastern New Mexico University are seen as a regional rival due to the close proximity of the two schools and frequency of match-ups between them. An example of this is Eastern New Mexico University's yearly attendance at the Texas Tech Open; an annual track and field event hosted by Texas Tech. Texas Tech Red Raiders alumni have gone on to play in the NFL, NBA, WNBA, Major League Baseball, and more. Current alumni standouts include NFL All-Pros Zach Thomas of the Kansas City Chiefs, Wes Welker of the Denver Broncos, Danny Amendola of the New England Patriots, and Michael Crabtree of the Oakland Raiders. ^ Andrews, Ruth Horn (1956). The First Thirty Years: a History of Texas Technological College. Lubbock, Texas: The Texas Tech Press. pp. 289–290. ^ a b c "2008 Baseball Media Guide". Texas Tech University Official Athletic Site. Archived from the original on 2008-10-29. Retrieved 2008-07-06. ^ a b "Texas Tech Year-by-Year Scores". Texas Tech University Official Athletic Site. Archived from the original on 2008-10-29. Retrieved 2008-07-06. ^ "Texas Tech's Hays becomes fourth coach to 1,500 wins". ESPN. ^ "Hays Earns His 1,500th Career Win As Tech Tops TAMU-CC". Texas Tech Official Athletic Site. 2008-04-02. ^ "Texas Tech Baseball: Milestone Victories". Texas Tech Official Athletic Site. Archived from the original on 2012-07-19. ^ "Texas Tech Baseball: Raiders in the Draft". Texas Tech Official Athletic Site. Archived from the original on 2012-07-30. ^ "Texas Tech University Baseball Players Who Made it to the Major Leagues". Baseball Almanac. ^ a b "Larry Hays steps down as Tech baseball's head coach". The Daily Toreador. Archived from the original on 2008-09-16. Retrieved 2008-07-04. ^ George Watson. "Larry Hays ends 22-year love affair with Texas Tech baseball". Lubbock Avalanche-Journal. Archived from the original on 2012-03-03. Retrieved 2008-07-04. ^ "Player Bio: Wes Kittley". Texas Tech Athletics. Retrieved 2008-09-30. ^ "Wes Kittley Bio". TexasTech.com. Texas Tech University. Retrieved 15 March 2015. ^ "New Big 12 Cross Country Champions Crowned" (Press release). Big 12 Conference. 2008-11-01. Retrieved 2008-11-02. ^ "Kithuka". Texas Tech University. Retrieved 8 April 2013. ^ "Texas Tech A-to-Z". Archived from the original on 2006-11-28. Retrieved 2006-12-31. ^ a b "Year-By-Year Game Results". Brut Sun Bowl. Archived from the original on 2009-12-02. Retrieved 2008-09-30. ^ "Texas Tech Football History Database". NationalChamps.net. Retrieved 2008-08-14. ^ Schlabach, Mark. "Teams just outside top 25 include big names, underachieving programs". ESPN. ^ Williams, Don (2007-09-09). "Texas Tech-SMU game facts". Lubbock Avalanche-Journal. Archived from the original on 2014-02-22. Retrieved 2008-08-19. 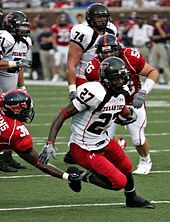 ^ The Red Raiders moved to fourth in 2008 when the Michigan Wolverines had a losing season. ^ "Team Records – Most Bowl Appearances". College Football Data Warehouse. Retrieved 2008-08-12. ^ Hendershot, Jessica (2007-05-31). "Men's golf to participate in NCAA Championship". The Daily Toreador. Archived from the original on 2007-09-27. Retrieved 2007-06-01. ^ a b c "Men's Basketball: History". Texas Tech Athletics. Archived from the original on 2008-04-21. ^ Rose, Rex (February 26, 2014). "Tech breaks Big 12 attendance record, falls to Kansas State". The Daily Toreador. Retrieved 26 February 2014. ^ a b "Siegel Voted Big 12 Coach of the Year". Texas Tech Official Athletic Site. 2008-04-28. ^ Coleman, Adam (2007-04-05). "Flock of Siegel: Tech's tenured tennis coach has built program from the bottom, up". The Daily Toreador. Archived from the original on 2007-09-27. Retrieved 2007-04-06. ^ "Tech Jumps to No. 17 in ITA National Rankings". Texas Tech Official Athletic Site. 2008-03-05. ^ a b Andrews, Ruth Horn (1956). The First Thirty Years: a History of Texas Technological College. Lubbock, Texas: The Texas Tech Press. p. 312. ^ "TTU Sport Clubs". Texas Tech University. Retrieved 2018-12-27. ^ "Jones AT&T Stadium. Delivered". AT&T. Retrieved 2008-08-30. ^ McKee, Catherine (December 14, 2012). "Expansion on Jones AT&T Stadium to begin Jan. 2013". The Daily Toreador. Retrieved 2 January 2013. ^ "Tech's United Spirit Arena opens to glowing reviews". Lubbock Avalanche-Journal. Archived from the original on 2013-05-16. Retrieved 2008-08-14. ^ "Jazz Results—Division IA". 2018 NCA & NDA Collegiate Cheer and Dance Championship. ^ "NCA & NDA College Nationals". National Dance Alliance. "2018-2019 Camp Bid Winners"
^ "Southwest Conference Champions, 1915–1996". Texas Almanac. Retrieved 2018-07-04. ^ a b Clark, Kyle; Siegrist, Nikki (2003-03-13). "Making Matadors: Spanish style architecture inspires Tech's first mascot". The Daily Toreador. Archived from the original on 2008-09-26. Retrieved 2008-10-15. ^ "Texas Tech Yearly Results". College Football Data Warehouse. Archived from the original on 2008-10-09. Retrieved 2008-10-15. ^ Chandler, Cory (2010-04-09). "Spirit Squads Fly High at National Competition". Texas Tech Today. Retrieved 2010-04-21. ^ "Texas Tech Masked Rider Program". Texas Tech University. Retrieved 8 April 2013. ^ Zimmer, Kelln. "T-sippers or tortilla-throwers". The Battalion. Archived from the original on 2009-09-08. ^ Weddle, Jason. "Aggies, Tech renew rivalry". The Daily Texan. Archived from the original on 2007-07-14. Retrieved 2008-08-06. ^ "Texas-Texas Tech Preview". Yahoo! Sports. 2006-10-28. ^ Finley, Eric (2008-10-29). "Tech students camp out at stadium before Tech-UT game". Lubbock Avalanche-Journal. Archived from the original on 2008-11-01. Retrieved 2008-10-29. ^ Lentz, Kerry. "Raiderville". Texas Tech Official Athletic Site. Retrieved 25 December 2010. ^ "Recap: Texas Tech vs. Baylor". Kansas City Star. 9 October 2010. Archived from the original on 2010-10-13. Retrieved 8 November 2010. ^ George, Brandon; Carlton, Chuck (2009-02-12). "Texas Tech, Baylor discuss playing football series in North Texas". Dallas Morning News. Retrieved 2009-02-13. ^ Hoffman, Brett (2016-09-21). "Texas Tech No. 1 at ENMU Rodeo". Lubbock Avalanche Journal. Retrieved 2018-09-22. ^ Dillon, Sean (2015-11-07). "Lady Raiders Dominate Exhibition Vs. ENMU, 77-43". Rock 101 FM. Retrieved 2018-09-22. ^ "Automated Box Score Recap: Texas Tech 11 ENMU 4". Texas Tech Official Baseball Wesbtie. 1999-06-21. Retrieved 2018-09-22. ^ "Red Raiders Host Texas Tech Open". Texas Tech Official Athletic Site. Retrieved 2018-09-22. ^ "Zach Thomas profile". NFL. Retrieved 2008-08-14. ^ "Wes Welker profile". NFL. Retrieved 2008-08-14. 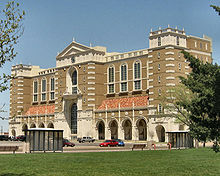 Wikimedia Commons has media related to Texas Tech Red Raiders. "College Nationals Wall of Fame". National Dance Alliance. Archived from the original on 2017-10-26.